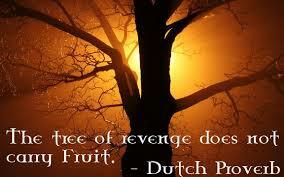 Do not seek revenge, for those who have wronged you live in their own vengeance. It is difficult not to be overwhelmed with feelings of hate and malice when someone has inflicted hurt on our Soul, we feel victimized and instinctively thoughts arise of how we must avenge, so we can cease the pain inside of us. If we do not act to retaliate then the bitterness becomes a source of food for our Ego, the animosity grows and becomes a spiteful beast within us. The feelings of strong dislike, hostility and resentment settles in every cell of our body, it runs through our veins like the verminous poison from a dangerous snake. The negative energy that we are holding onto weakens our Spirit, we begin to feel the effects on our physical body, our mind and our emotional well being, the refusal to let go and move past the scenario brings on a state of self-rejection and we begin to ‘hate’. What good is it for us to live in a state of detest, when the only one that is passionate to despise is ourself! What someone did to us, is non of our business. This is a strong statement but let the truth be known. The malevolence that this other human being acted out against you has everything to do with who they are, it has nothing to do with who you are. For you to take revenge on such an act would be foolish and unintelligent. You know you are more conscious and aware and you know for you to act impulsively or even if you were to premeditate a plan to retaliate it would be against your true nature, you would end up eventually in a state of regret, this is not a solution nor a means to the end of your suffering. Mahatma Gandhi was known to have said ‘an eye for and eye makes the whole world blind’. Let go and let the power of Karma take care of those who are unconscious, and you my friend keep your faith that with every challenge we face, know that it is an opportunity for you to evolve your beautiful Soul.